If you’ve been on the fence on wanting a natural body cleanse or a detox, perhaps learning more about its benefits may help you decide. Naturally, our body or our liver has a way of detoxifying itself - through sweat and urine. However, our liver needs all the help it can get and a body cleanse is a great way to take the stress out of it. 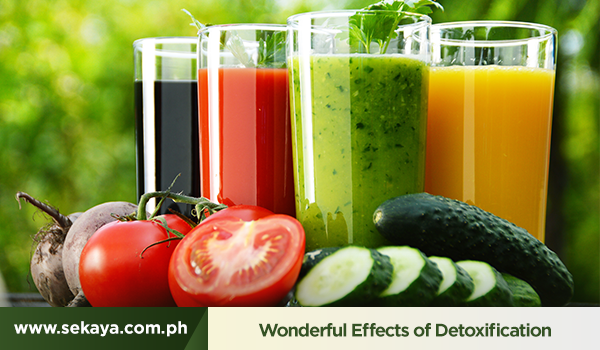 Here are ways a detox can benefit your body. While cutting out sugar and caffeine may seem daunting especially if you constantly take it when you need a boost of energy, replacing them with water can guarantee the same result sans the afterward crash. Plus, you’ll stay hydrated throughout the day! During a detox, the body and its organs function the way that it is supposed to. In particular, it frees up the immune system making it able to absorb nutrients better. Many of the recommended foods during a body cleanse help the lymphatic system, which keeps the body it tip-top shape. Exercising also plays a big role in the circulation of lymph fluid through the body and helps it to drain, making the immune system stronger in the process. Did you know that food that causes us to be lethargic like fatty and sugary food can also affect our quality of thinking? That’s why a good detox can help result in a more focused mind. A good yoga session can also help you be one with your body during this time of purge. You may find that your breath may actually worsen during the initial detox process. This is a normal occurrence as toxins are being released from the body. However, after this, your breath can significantly improve. Obviously, switching to a healthier lifestyle would result in weight loss. However, these results won’t last if you don’t emphasize replacing your unhealthy diet for a better one after your cleanse. Detoxing is a great primer for you to establish long-term healthier eating habits. If you are experiencing pimple breakouts during a detox, then it means you are the right track. This is a natural process that your skin goes through as all the toxins in your body are getting released. Another way to help detoxify your skin is to go to a sauna and sweat off all the gunk from your body. Skin Cleanse Botanic Infusions contains sarsaparilla root which was used in the 19th century as an internal cleanser of toxins. It also aids in combating skin problems such as psoriasis, eczema, and dermatitis. Expect clearer and smoother skin after your detox.